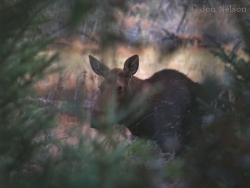 Posted June 6, 2010 in Photographs of Quetico Provincial Park. 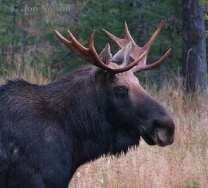 Quetico has a wide variety of wildlife. 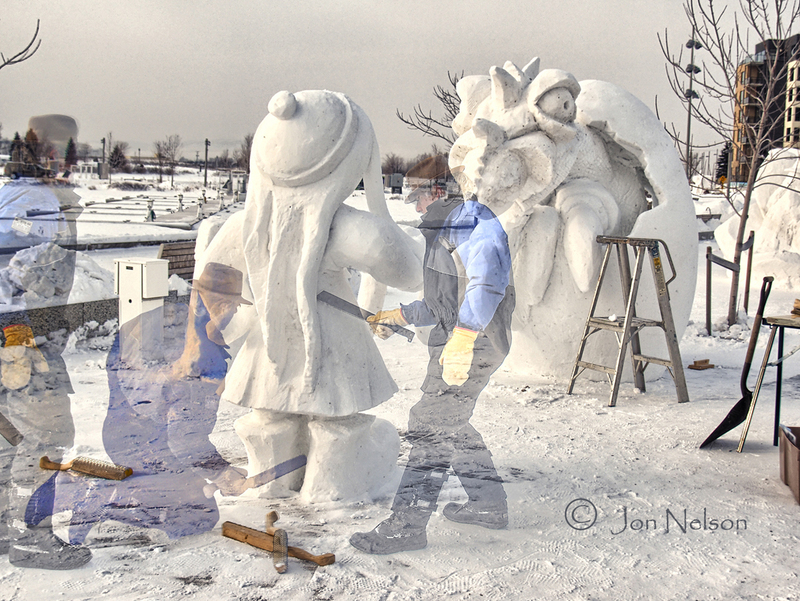 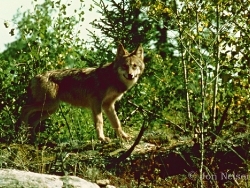 This gallery has photos of a few of the creatures often seen in the park. 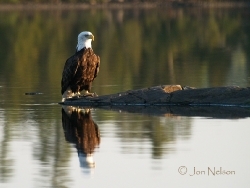 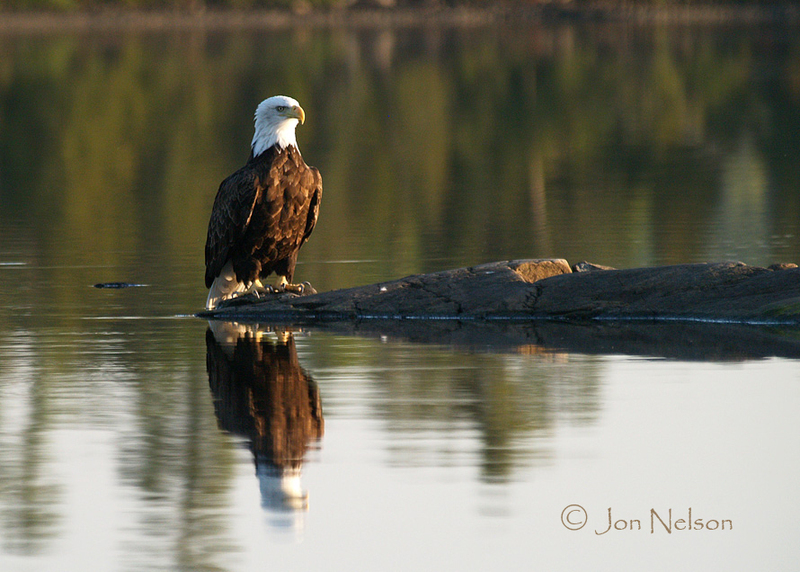 A bald eagle on a rock on the way up to Ranger Bay on Basswood Lake. 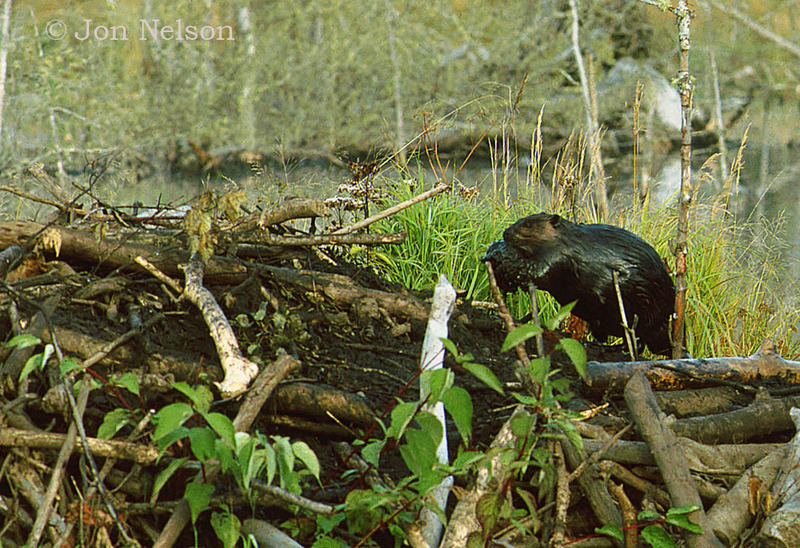 Someone may have left fish guts here or it is just enjoying a beautiful October afternoon. 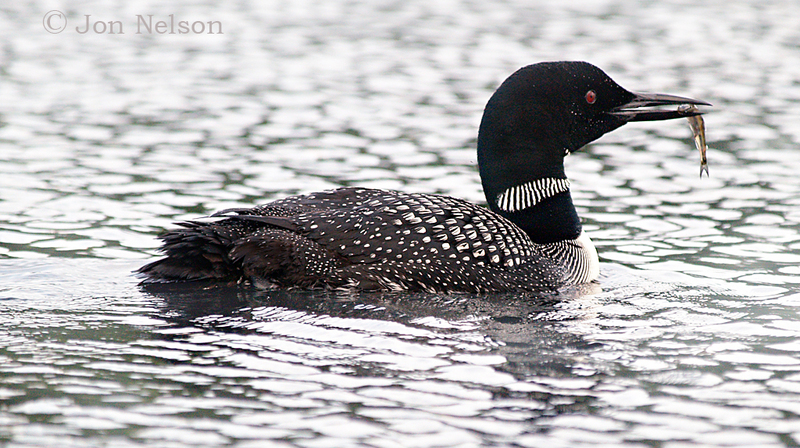 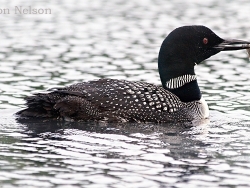 Loon swimming with minnow in its beak on French Lake. 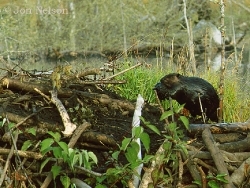 A beaver carrying mud to fortify and strengthen the dam. 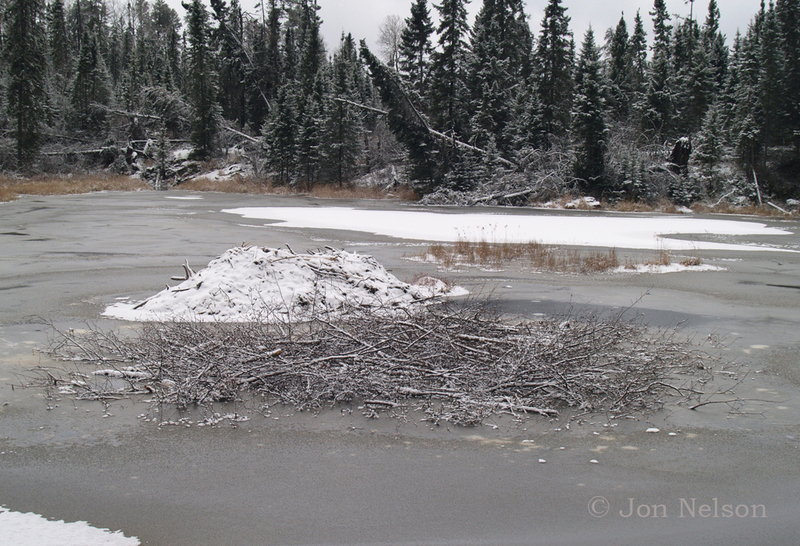 A beaver lodge and its food cache at freeze-up. 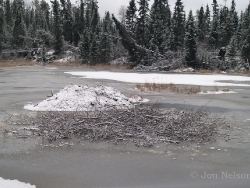 This cache of food must feed the occupants of the lodge until ice-out in the spring. 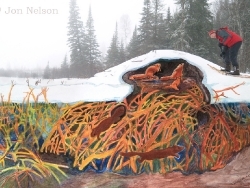 The contrast between the somber, grey winter morning and the activity beneath the ice is captured in this combination photo/painting. 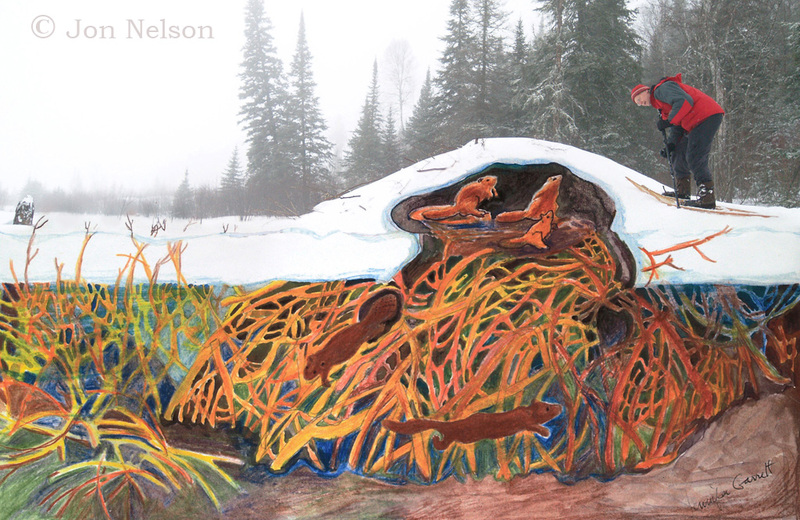 Painting of activity under the ice and in the lodge by Jennifer Garrett, photo by Marie Nelson. 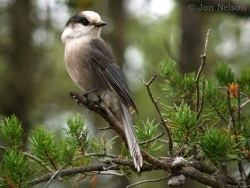 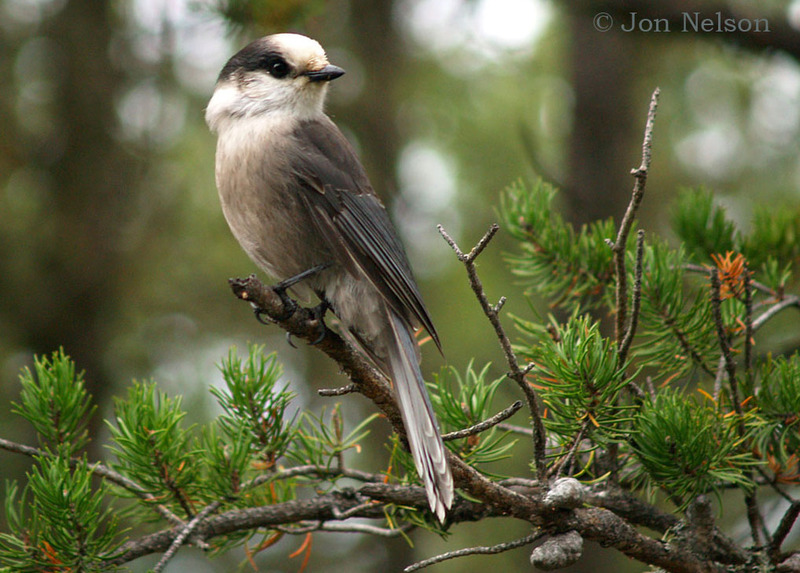 A whiskey jack hoping for food perches on a jack pine at the edge of a campsite. 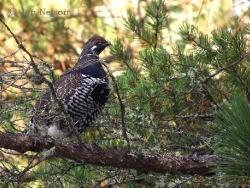 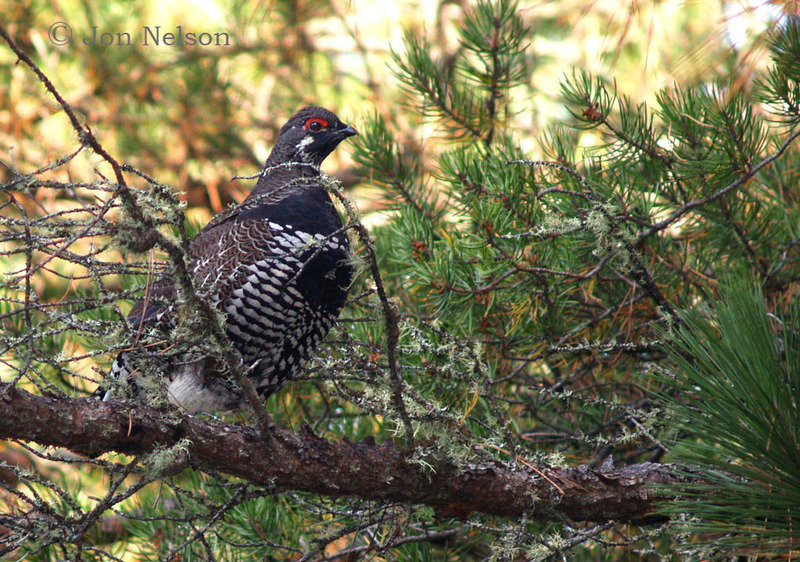 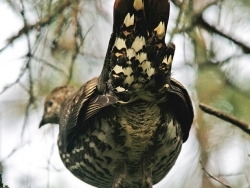 Spruce hen in a tree on a September morning in the northern part of the park. A young bull moose with a small rack that won't intimidate other bulls or, more importantly, impress many females. 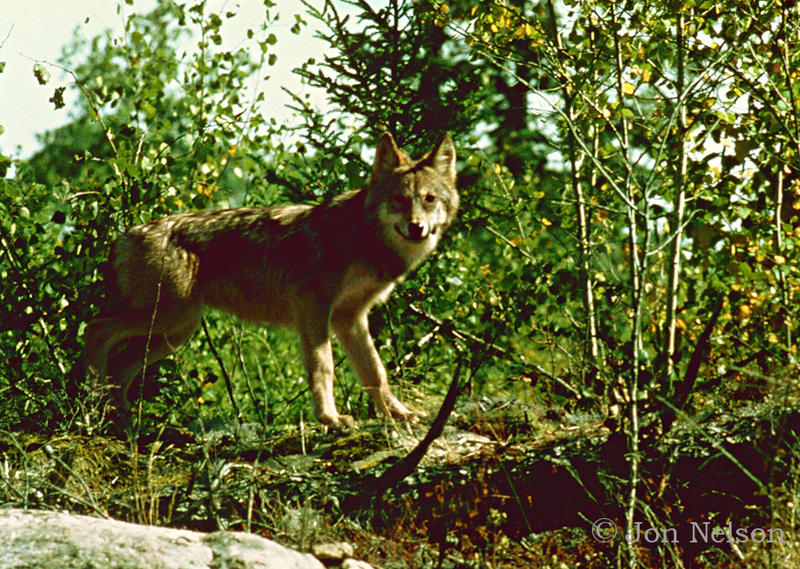 A timber wolf at the moment of awareness that a human was close by. 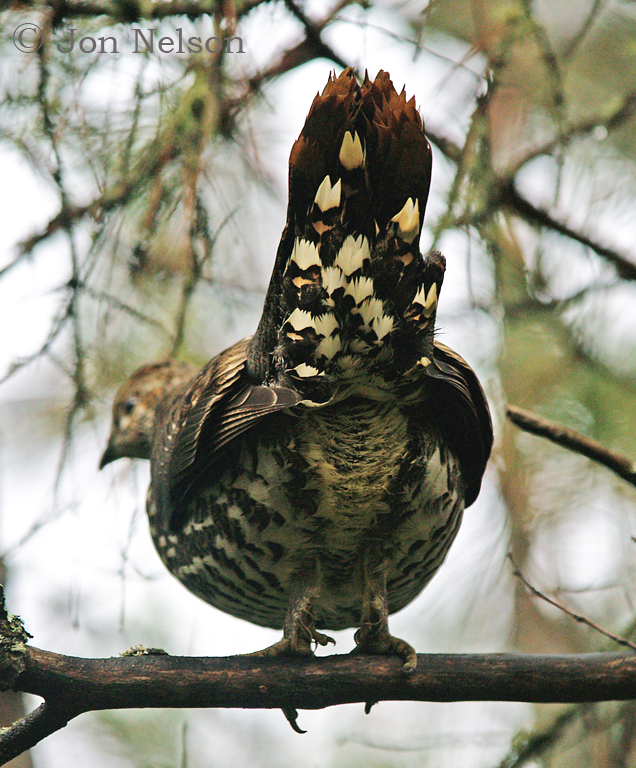 A partridge that seems to be showing disdain for the photographer. 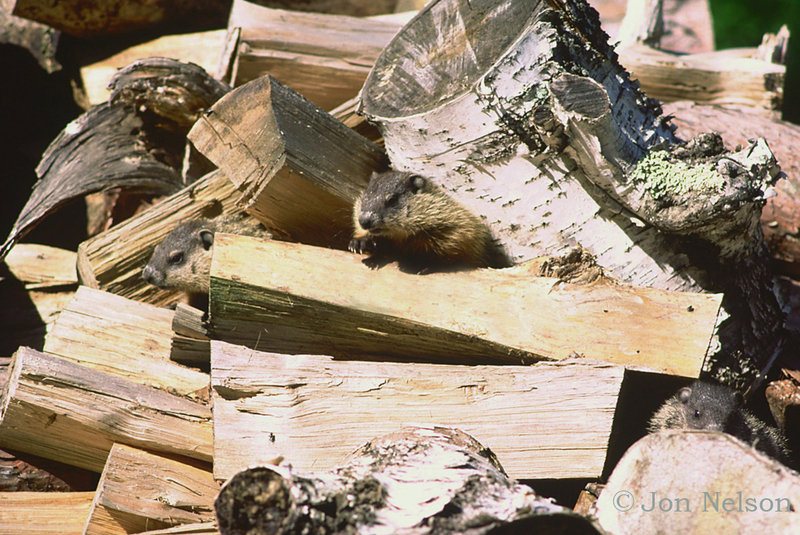 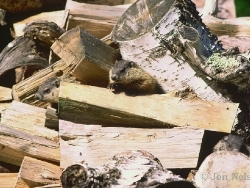 Two woodchucks in a pile of firewood at the Prairie Portage ranger station in 1984. 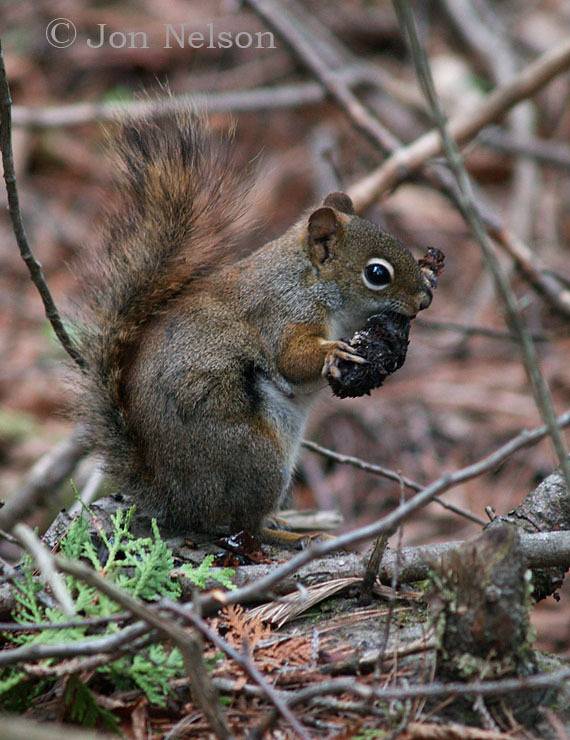 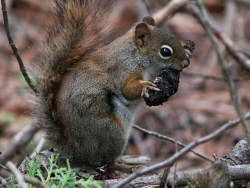 Red squirrel feeding on seeds from a soggy white pine cone. 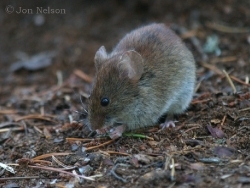 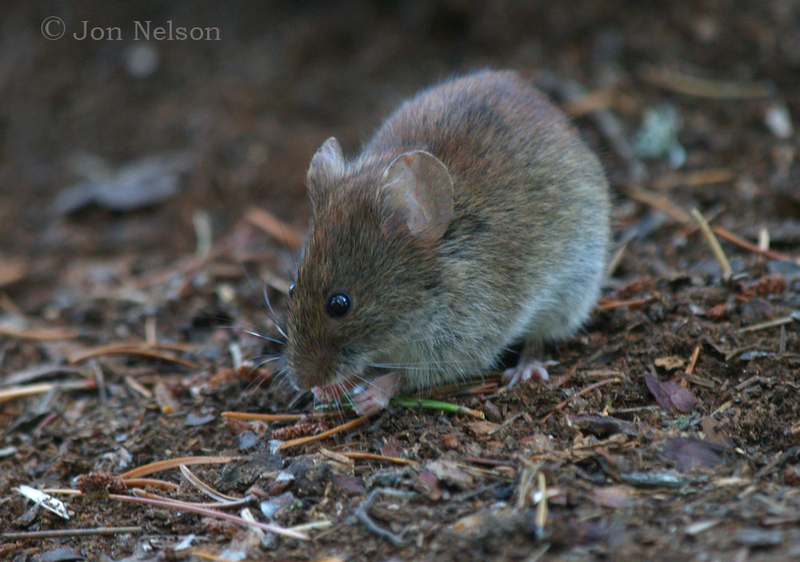 A redback vole searching for food on a Rawn Lake campsite. 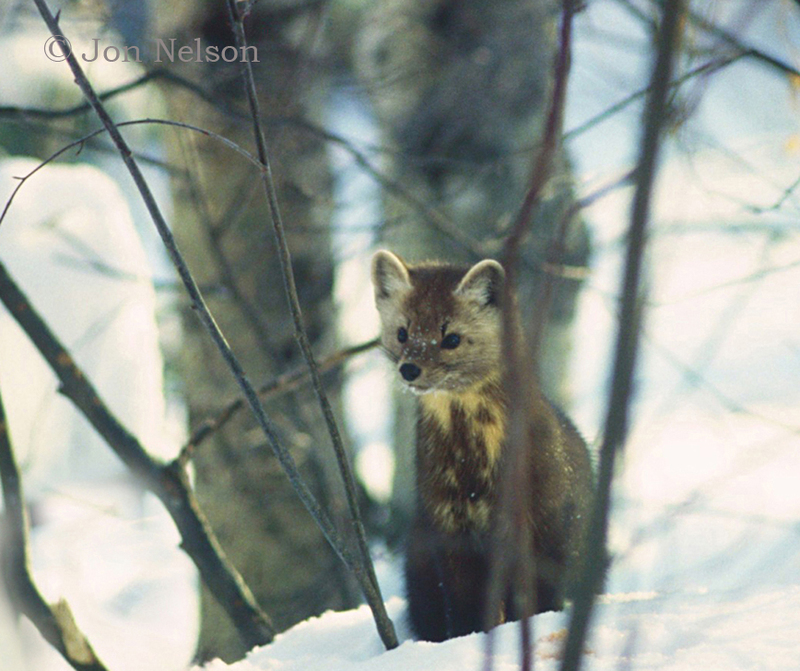 Pine marten sitting in the snow watching for prey.